"Carbon footprints" dominate the news about the environment, but there are equally as large issues. China has built one of the largest high-speed passenger rail networks in the world, while, ironically, their air quality is some of the worst in the world. Why? Nearly, all of their electrical generation is made with coal. Nevada Intercity will operate its turbine powered, JetTrain locomotives on a 50/50 by weight blend of B100 biodiesel and methanol from natural gas. Recent events in the U.S. make that move a good one. First, U.S. oil demand is flattening due to a combination of factors. The U.S. Government takeover of GM and Chrysler allowed the government to demand the production of significantly higher mpg vehicles. Combined with the popularity of hydrid cars, and the growing market for all-electrics, demand for gasoline is permanently dropping. The conversion of many coal burning plants in the U.S. to natural gas from newly discovered deposits such as the Bakken, Eagle Ford, and Marcellus shale formations has cleaned up U.S. air quality significantly. Several solar power electrical generation plants have opened in the southwest bumping up total U.S. solar power generation to over 10 gigawatts. The 239 passengers riding on one of our trains won't be driving cars, or taking twin engine jet aircraft, but will be traveling down smooth, continuously welded rails pulled by the power of a single turbine engine at speeds above 150 mph. (Please see the Power Point slideshow, "JetTrain Emissions Data" lower down on this page). Trees are a vital component to bringing down carbon dioxide levels in the atmosphere. Nevada Intercity will not use any wooden ties in its construction. Instead, we will employ a combination of concrete and composite cross ties. The composite ties are made from recycled tires and plastics. Highways form an impermeable surface and are designed to drain water from their surface to concrete pipes, and from there to streams and rivers, robbing natural, underground aquifers of water that would normally fill them through percolation depriving tree and plant roots of vital moisture. With larger areas of sparse vegetation, carbon dioxide can't be scrubbed from the air. In contrast, Nevada Intercity's right-of-way will be a comparatively narrow, ballast-topped (gravel) packed dirt berm, with a much lower impact on the surrounding vegetation. 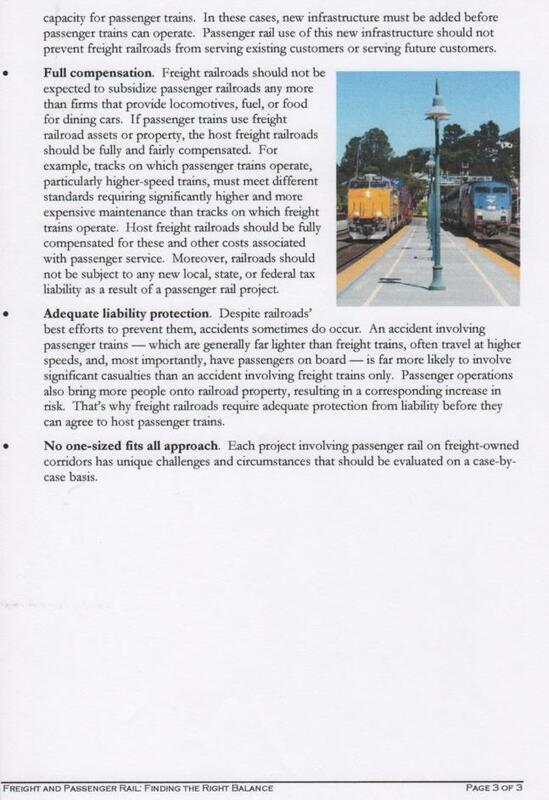 International experience in implementing high-speed rail has focused on grade separation: separating roadways from intersections with rail right-of-way. Nevada Intercity will pre-plan roadway and railway over and underpasses to make certain the highest speed possible can be maintained with the greatest degree of safety. We will apply the same consideration to wildlife, as well, and work with Nevada Department of Wildlife to identify game trails in order to site wildlife overpasses to preserve the health and diversity of Nevada's rangelands. NIPR will use existing financial, topographic, historic, and infrastructural resources to create cost effective advantages for our investors, and Nevadans, to build a high-speed rail system within Nevada, and between our neighbors California, Arizona and Utah. The intercity right-of-way will connect with the urban commuter systems we will establish in Clark County, and Northwestern Nevada (Minden, Carson City, Reno-Sparks) hereafter referred to as M-CC-RS, but will include commuter service to the towns located east of Sparks, Nevada, and the Truckee River Canyon. The M-CC-RS region will include Fernley, the Tahoe-Reno Industrial Center (Site of Tesla's Gigafactory), and Fallon's growing agribusiness base. 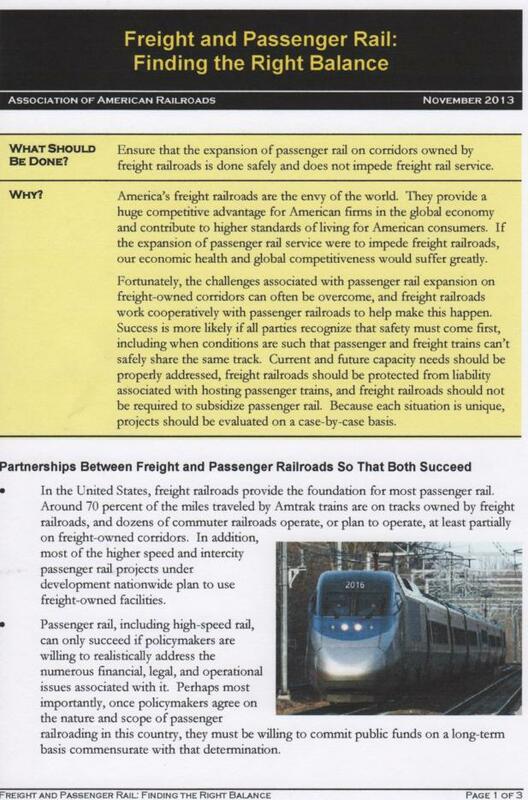 One of the academic resources that can be exploited are the three environmental and economic studies conducted by three different railways: the proposed nuclear waste dump railroad, the DesertXpress EIS, and the ridership-feasibility study of a Los Angeles to Las Vegas rail service done by the Regional Transportation Commission of Southern Nevada in completed in 2007 (below). The groundwork, and data, provided by these studies will allow Nevada Intercity to compile an EIS very rapidly, and establish service between Los Angeles and Las Vegas within a year providing speedy ROI, while the rest of our Western Nevada Subdivision is under construction. So, why do so many big American cities like Los Angeles or Chicago have a railroad running through their downtown core? Simply put, the railroad was there first, and the cities grew up around them. Originally, the railroads would have been built to serve a specific need such as carrying timber to a sawmill, livestock and produce to market, or ore to a stamp mill. As individuals used the advantages the railroad provided to create opportunities of their own, towns sprang up along the routes, and the towns grew into cities. Although scenarios like that have unfolded all over the U.S. in the past 150 years, the value of a railroad has not diminished. Nevada Is still growing as the second link, below, indicates. When Nevada Intercity's Western Nevada Subdivision right-of-way is completed, it will connect Nevada's two most economically powerful regions together. Reno-Sparks and the nearby towns and cities in the northern region see nearly 5 million visitors per year, so even though the population is under one million people, the pool of potential passengers is quite large. Las Vegas sees over 30 million visitors per year, and has a resident population exceeding two million people. The western Nevada counties of Douglas, Carson, Washoe, Lyon, Churchill, Nye, Esmeralda, Mineral and Clark that will be linked by Nevada Intercity had a combined $123 Billion in exports in 2012. 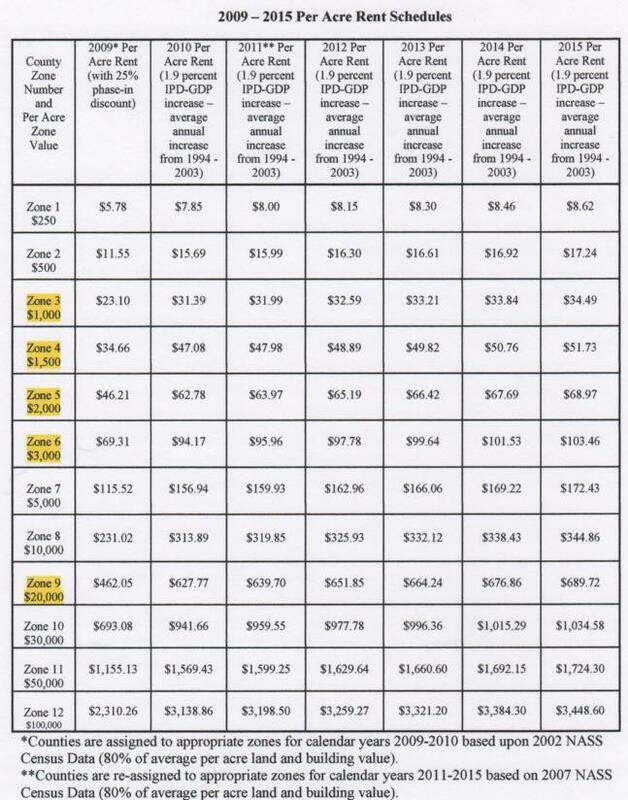 During the same period, those counties imported $100 Billion. Between the existing economic muscle, federally owned land, and the growth potential of the region, as well as the volume of visitors and freight, it becomes clear the railroad's operations will be well justified and sustainable. Federal land ownership of 80% of Nevada has often been both a boon and a bane to Nevadans. In the instance of Nevada Intercity's intended route, it is most definitely an asset. Key to the viability of any railroad is its usefulness: The more rail operators using it, the more revenue it generates to provide for maintenance-of-way. Not only will Nevada Intercity operate express trains, inter-city commuter service, and tourist specials, but Class I freight carriers (i.e. 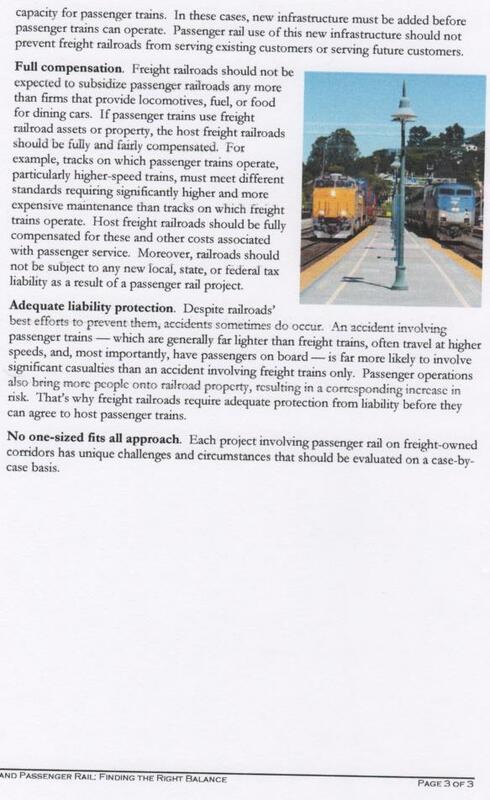 BNSF, Union Pacific, etc) will undoubtedly use the right-of-way, too. As part of the overall plan, operations will accommodate intra-city or inter-urban service for commuters provided by the Regional Transportation Commissions for Clark (Las Vegas) and Washoe (Reno, Carson City and Minden) counties. The stage is set for high-speed rail to enter the scene. You may be asking yourself, "How quickly can Nevada Intercity's high-speed rail be built?" 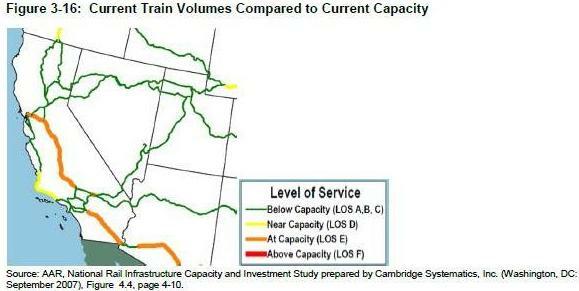 NIPR enjoys a large advantage of having existing east-west rail corridors at both ends of the state. Nevada has a unique geography: it's mountain ranges are mostly oriented north and south, naturally facilitating the construction of Nevada Intercity's right-of-way. 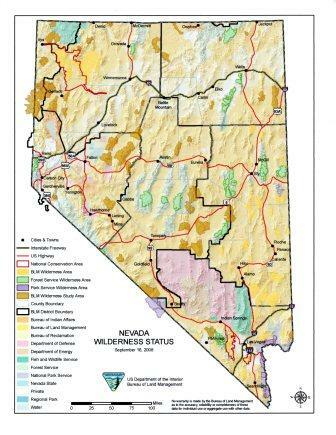 Most of the land between Reno and Las Vegas is Federally owned, and controlled by the BLM. There are 21 valleys through which The Railroad's track will be lain. Only eight of these valleys are connected through narrow defiles or canyons. The remainder flow into one another through fairly wide, low passes flanked by mountain ranges. Track providentially exists in two canyons connecting four valleys vital to the route. The need to tunnel will be minimal compared to the overall length of the right-of-way. Strategic double or triple-tracking in these broad valleys will allow the safe, and efficient, at-speed movement of trains around one another.The completed track will link Union Pacific's Transcontinental Railroad route in the north with its southern route between Los Angeles and Ogden, Utah, in Las Vegas. Union Pacific's track from Reno links with tracks to Oregon and Washington, and extend, through Canadian Pacific and Canadian National rights-of-way, into Canada. Eventual construction of Nevada Intercity's track to link with BNSF's railyards at Kingman, Arizona, and will extend south, roughly paralleling Highway 93 down to connect with BNSF's track at Wickenburg, Arizona which extends all the way to Phoenix. The north-south connection through Las Vegas will augment the existing east-west connection between Las Vegas and Los Angeles, and Las Vegas and Salt Lake City, making Las Vegas one of the largest rail hubs in the Western U.S.
BNSF's connection with Union Pacific's lines into Mexico, when combined with NIPR's right-of-way, will provide a much faster, more direct border-to-border rail link for both passenger and freight service than a route following the west coast. After securing its licensing from the Surface Transportation Board, NIPR will open negotiations with Union Pacific for permission to use their rights-of-way. The construction of NIPR's track will be divided into administrative units called phases. All five phases will begin construction simultaneously. The Minden-Carson to Reno-Sparks phase will include building track from UP's east-west Transcontinental Railroad corridor in Sparks, south, across the Truckee River to link with the Reno-Tahoe International airport. This relatively small section of track, only four miles, will connect the airport to 176 miles of track for Nevada Intercity's intended route. It also creates a rail link from the airport directly to both downtown Reno and Sparks, as well as providing Amtrak access to the airport. The airport in turn will have passengers from across northern Nevada and parts of northern California, intending to take flights, delivered to their main terminal. A major component of Phase II of the right-of-way construction will involve improving two branch lines that depart from UP's Transcontinental Railway at the hamlet of Hazen. 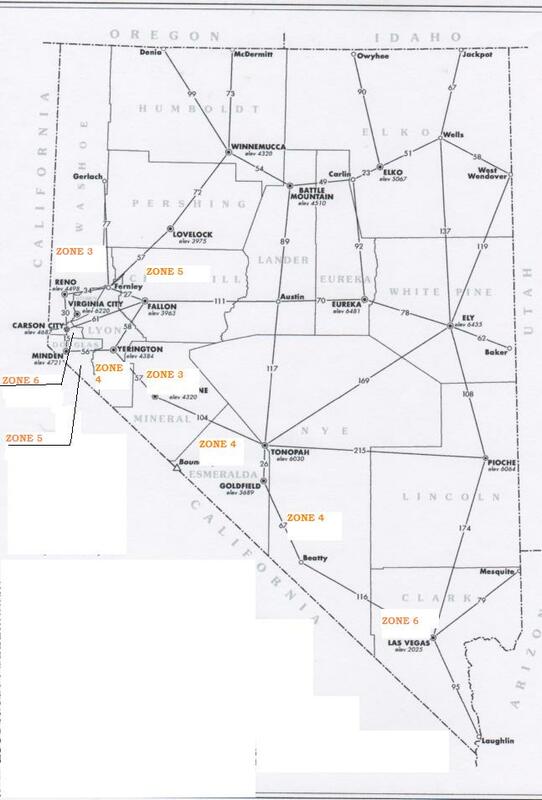 Primary focus will be on upgrading the branch line from Hazen to the town of Hawthorne, a distance of about 115 miles. Modern track laying methods and equipment can put down three miles of track per day. Nevada's climate is one of the driest in the nation, easily providing a long construction season. With several track laying machines, and crews, working on the improvements, the work on this segment should be accomplished in a matter of months. The Mina Subdivision, as Union Pacific calls it, will then become the test track to find the JetTrain's top speed while pulling a full consist of tilting passenger cars, and obtain fuel consumption figures for its intended 50/50 B100-Methanol fuel, as well as other mixtures. 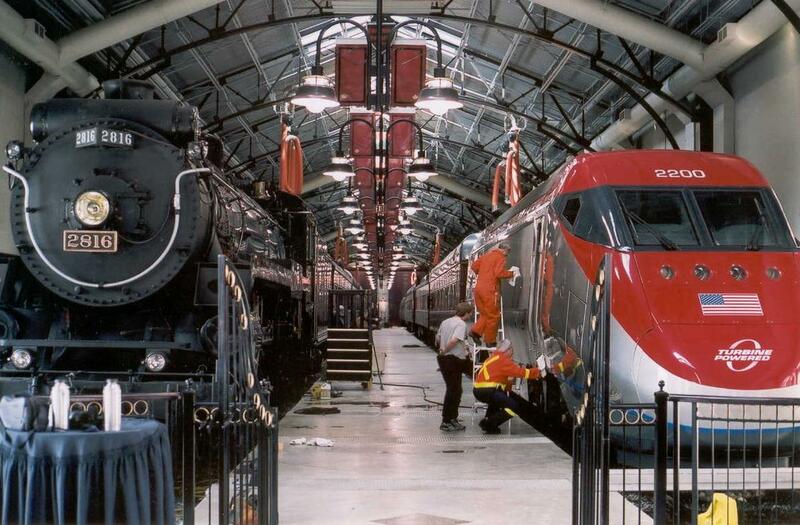 The high-speed runs will also serve as an in-motion school for crew trainees. While licensing, track usage negotiations, FAA construction permission requests, and EIS/EIR are in-process, the first component upgrade to the locomotive will be underway. The first component upgrade will be completed within 15 to 18 months, and ready to be tested on the Mina Sub. Conceptual plans call for the entire route--Minden to Las Vegas--to be completed in a year-and-a-half after commencement of construction. Nevada Intercity's modifications of the JetTrain will allow the expansion of high-speed passenger rail across the U.S. very quickly. To get down to specifics, NIPR will improve the performance of the JetTrain locomotive by replacing the current gear reduction box and twin generators with a high-speed, permanent magnet generator that will save weight, increase reliability, and enhance speed. Another variation on the locomotive will incorporate an already-designed fly wheel, storing energy that will allow the locomotive to accelerate from a standstill to a speed where the turbine will power up and operate efficiently. The prototype flywheel was completed in 2005. The high-speed generator and the flywheel were intended to be added to the JetTrain design, together, as a modification termed ALPS, Advanced Locomotive Propulsion System. The flywheel equipped JetTrain locomotive will make the train more cost effective for routes in higher population areas with frequent stops. The addition of a fuel tender will greatly extend the JetTrain's range, giving it long enough "legs" to serve on coast-to-coast routes. It seems obvious that a passenger railroad is going to be committed to serving people. Nevada Intercity's commitment to people will not extend to our passengers only. The process of building the railroad, manufacturing the locomotives and trainsets, and connecting Nevada's small towns to the prosperity of their nearest, big city will create many jobs nationwide. NIPR will make a concerted effort to employ amputee Afghanistan and iraq War veterans, though veterans of that war, in general, will have priority in hiring. We will make extensive use of interns from Nevada's University system to fulfull the goal of providing real-world experience to these students. The experience provided by the intern program should allow the student, on graduation, to find a job more quickly, and pay down any student loan debt.